If you are looking for a new dinnertime keto meal idea, here’s one for ya! 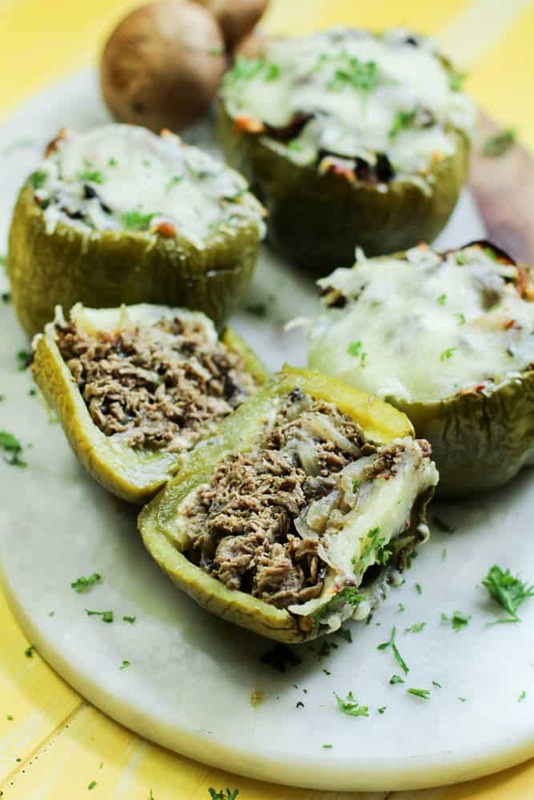 You have got to try this Keto Philly Cheese Steak Stuffed Peppers recipe! It’s fairly easy to make and it totally reminds me of the Philly cheese sandwich I used to know and love before giving up bread on my keto journey. And to be honest, I don’t even miss the bread. Not one bit. Where Can I Buy Philly Cheese Steak Meat? 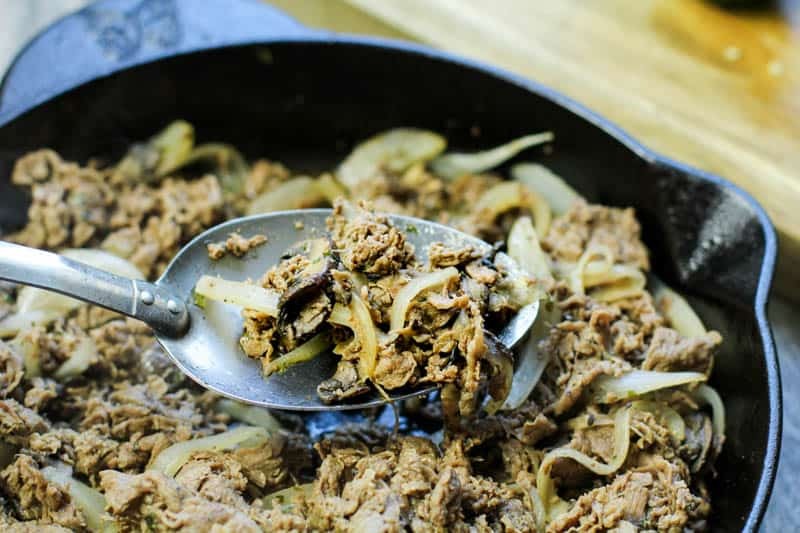 The number one most asked question I get about this recipe is “where can I buy Philly cheesesteak meat?” I have two different options for you. You can use your favorite steak and make sure it’s shaved thin. It’s really hard to do this at home though. I love a good ribeye steak because it’s nice and tender but there is no way I can shave it thin enough for a Philly Cheesesteak recipe. I will often time ask the grocery store butcher to slice it for me the thinnest possible. They are happy to help too! Here’s another idea for you if you don’t want to go through the trouble of finding a steak and then asking the butcher to slice it for you. If you are at Walmart, you can purchase the Great Value Sirloin Philly Steak Meat. It comes in a 14 oz box and you often times find it near the meat section in the prepacked meats area. I always keep a few of these packages in my freezer for a last minute meal idea. They are super easy to fry up even when they are frozen. I never defrost them. I just remove the frozen meat from the package and fry it. It’s thinly sliced so it cooks fairly quickly. This is my go-to meal idea when I’m way too tired or if I forgot to defrost a meat option for dinner that night. Want another tip for a fun Keto meal idea? Try using the same Philly Cheese Steak meat and put it on some Keto Fat Head Dough Pizza to make a very good Keto Dinner meal! Better yet, dough up on this recipe and save the meat and peppers to use for pizza the next day. It’s a totally different meal but partially using leftovers. Less time in the kitchen preparing food makes me happy! There’s a tip in the Keto Fat Head Pizza Dough Recipe that tells you how to make double and triple batches and freeze them too! In a large pan over medium high heat, add oil. Once oil is heated add in onions. Cook for a minute before adding in steak, seasonings, and Worcestershire sauce. 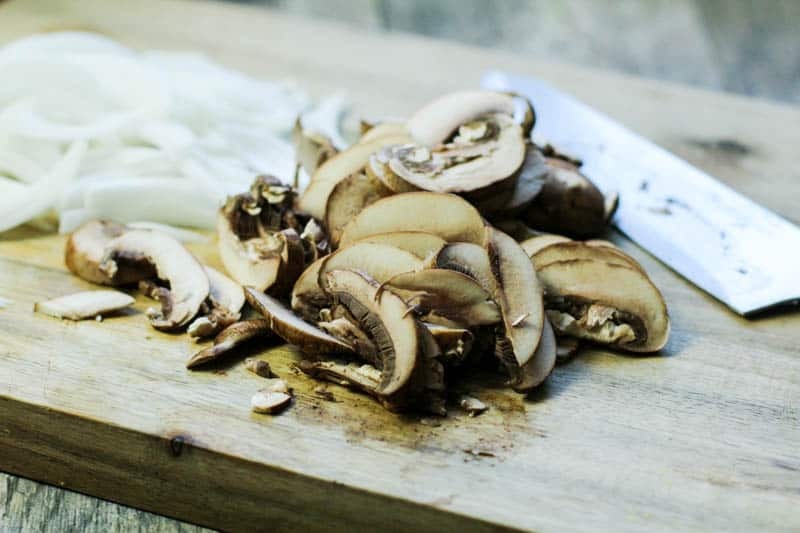 Continue cooking for 3-4 minutes, stirring often, then add in mushrooms. Continue cooking an additional minute or two (lower heat if necessary). Remove from heat. 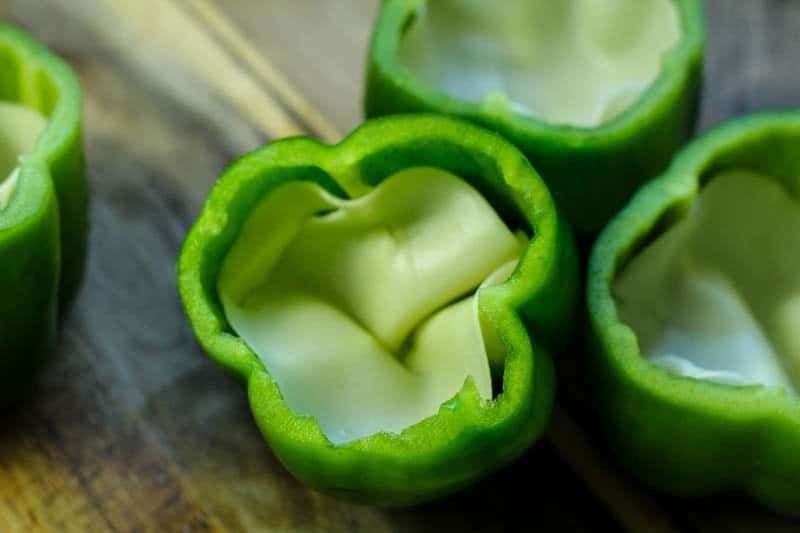 Fill each green pepper with one slice of provolone cheese. Then evenly pack in the cheesesteak mixture into each green pepper. 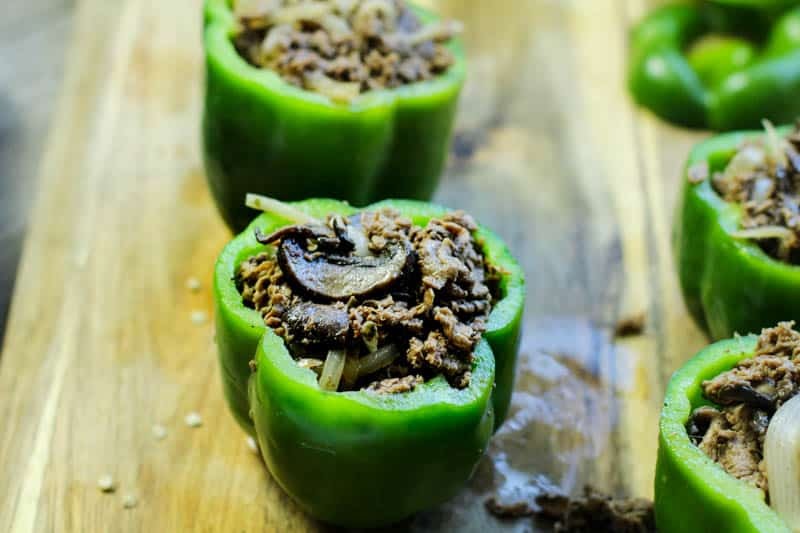 Place stuffed peppers on a baking tray and bake for 40 minutes. 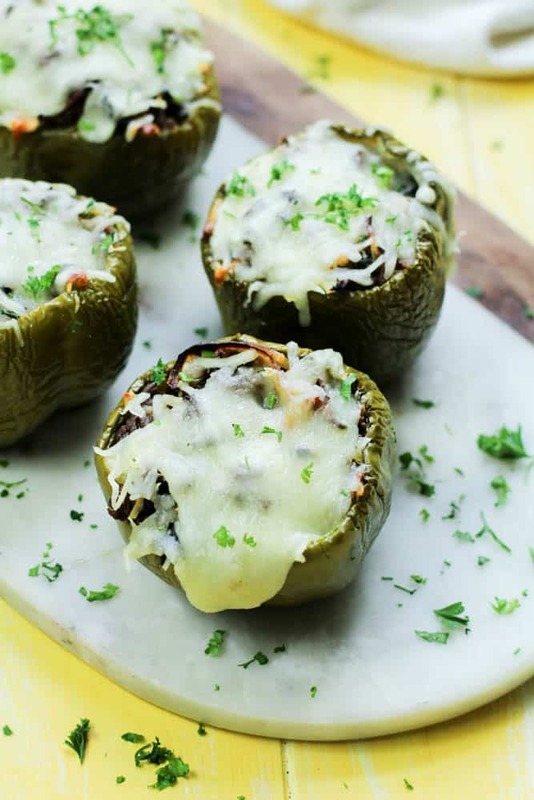 Take out the pan and add shredded cheese to each green pepper and return to the oven until cheese is melted and bubbly, about an additional 5 minutes. 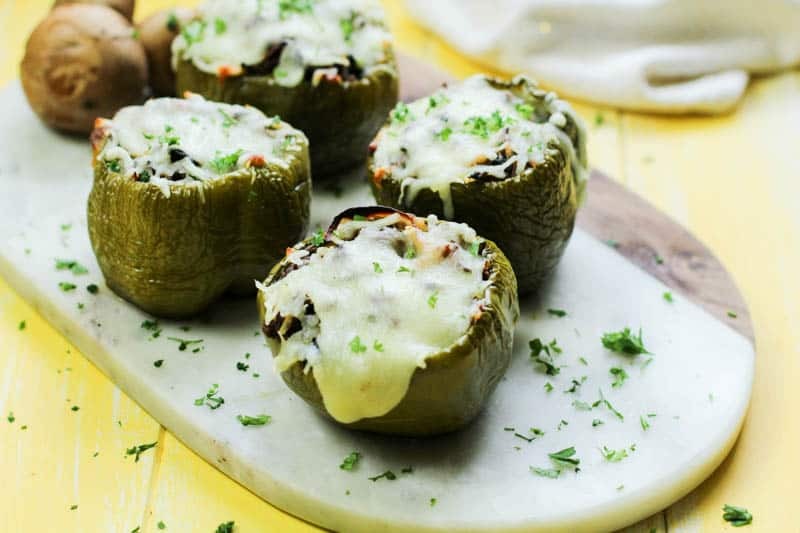 Fill each green pepper with one slice of provolone cheese. Then evenly pack in the cheese steak mixture into each green pepper. Be sure to read the tips in the post on where to buy Philly Cheese steak meat! By Neyssa on August 8, 2018 Keto Dinner Recipes, Keto Friendly Recipes, Keto Lunch Recipes, Low Carb Recipes, Main Dishes, Recipes. Does the Walmart Philly steak need to be defrosted for this recipe? I’m a recent follower of your weekly meal plans. I keep seeing Keto Philly cheesesteak pizza on the meal plans but I cannot find a recipe for this on the website. Can you please help with this? It would be greatly appreciated.